Table of Contents Rentals	5 GRASP	6 Aquatics 8 Athletics	12 Community Recreation Centers	22 Environmental Education 26 Parks	36 Special Events	37 Community Garden	42 Volunteer	43 Cemetery	47 Locations	49 Photo Release Please note photos taken during programs, events or at facilities could be used for future communications, marketing and public relations efforts including social media. Office Hours Monday â&#x20AC;&#x201C; Friday, 8 a.m. â&#x20AC;&#x201C; 5 p.m. In the event that inclement weather forces events or programs to be cancelled, all efforts will be made to make an announcement as soon as possible. Planning a special event? Check out the wide variety of facilities available from Des Moines Parks and Recreation. No matter what you are planning – baby shower, class reunion, birthday party, wedding and more – you can find the right sized venue. •	Open-Air and Enclosed Shelters •	Conference Rooms •	Gyms •	Gardens •	Amphitheaters •	Gray’s Lake Park Terrace and Green Spaces •	Aquatic Centers and Wading Pools To ensure you get the site and the date you want, make your reservation now! Review pricing and make your selection online at dmparks.org. GRASP stands for Greater Des Moines Recreational Activity Scholarship Program. This program allows low-income families discounts on programs and rentals. •	Have your income verified by IMPACT Community Action Partnership. Schedule an appointment by calling 515-518-4770 or visit 500 Army Post Road, Suite 17 or 3226 University Avenue. An opportunity for dogs to celebrate the last day of the pool season! Dogs must be able to swim and be supervised by their owners at all times. Cost: $4 per dog, Regular admission for owners Ashworth, Birdland, Nahas and Northwest on Sunday, August 18 from 3:00 p.m. - 5:00 p.m. Teachout on Monday, September 2 from 4:30 p.m -6:30 p.m.
Start times vary: 9:00 a.m. 1:00 p.m., 6:45 p.m. and 7:45 p.m. Five (5) lessons total. Each lesson is 45 minutes. These programs introduce children to team sports, teammates, and game situations while learning the basics in a fun atmosphere. Teams will be separated into single age groups 3,4,5,6. Each team is co-ed and will have a parent coach. All equipment, including a jersey will be provided. Des Moines Parks and Recreation and Des Moines Public Schools partner to offer these programs. Participants may register a team or individuals for all sports. Teams will be separated into single grade groups: 1st, 2nd, 3rd , 4th and 5th grade divisions. Each team will have a parent coach. Standings and score will be kept and officials provided unless otherwise noted. Practices and games will be held at least once per week and league tournaments will take place at the end of the season. All equipment, including a jersey will be provided. Des Moines Parks and Recreation and Des Moines Public Schools partner to offer these programs. Participants may register a team or individuals for all sports. Teams will be separated into single grade groups: 6th grade and 7th grade divisions. Each team has a parent coach. Standings and score will be kept and officials provided unless otherwise noted. Practices and games will be held at least once per week and league tournaments will take place at the end of the season. All equipment, including a jersey will be provided. 6:30 p.m. - 9:20 p.m.
All ages. Anyone under 16 must be accompanied by an adult. Des Moines Parks and Recreation is helping Monarch butterflies and pollinators in our city parks and you can help too. On Saturday, May 18 from 10:00 am to Noon, Parks and Recreation will host a Plant.Grow.Fly. event at Grayâ&#x20AC;&#x2122;s Lake. Sign up to be part of the program and not only will you help create a new Butterfly Garden, but you will make a butterfly friendly planter to take home with you on the same day. The first part of the program will involve learning about what pollinators need so they can survive and why they are important to people. Second, participants will decorate and fill a flower pot they design themselves. The planters will help support pollinators and participants will take it home with them. The last part of the program will actually be planting native Iowa species of plants in a new Butterfly Garden. Be prepared to get your hands dirty and do a little work to help out Monarchs and pollinators. Registration for this event is limited and the fee is $10 per take home planter created. In an effort to increase habitat for Monarch Butterflies, Des Moines Parks and Recreation is planting several species of milkweeds in some of our parks. This time we are adding milkweed plants to the James W. Cownie Baseball Complex and we are going to need some help putting the plants into the ground and getting watered so they will survive. Participants will listen to a short informative presentation about Monarch Butterflies, receive instructions on how to handle the milkweed plants and then we will get our hands dirty. All ages program . Anyone under 16 years old must be accompanied by an adult. Participants under 16 years of age must be accompanied by an adult. Anyone under 16 years old must have an adult present to participate. This program links proficient archers with property owners in Des Moines on private property and some selected park areas to address the overpopulation of deer. A Proficiency Test and the Bow Hunters Safety Course through Iowa DNR required. By approved permit only. Mayors Annual Ride and Run (MARR) April 20th Proceeds from both events go towards area trails. Run 9:00 a.m. and Bike Ride 10:00 a.m.
Volunteer instructor led Yoga sessions in our parks on Saturday mornings. If you are interested in volunteering, please contact parksvolunteer@dmgov.org. Sponsored by Unity Point Health - Des Moines. Neighborhood Association sponsored events in our parks, on Thursday nights. Movie starts at sundown usually offered May - August. The City of Des Moines is celebrating National Kids in Parks Day on Saturday, May 18 at Gray’s Lake Park. This is a national day of outdoor play celebrated by parks, cities, and towns nationwide. Thousands of families across the United States will be celebrating along with Des Moines. Here is a list of the activities that are part of the celebration! 10:00 a.m. - 8:00 p.m. – $1 Bike and Boat Rentals Enjoy a 30-minute bike or boat rental for just $1 all day from 10 a.m. 8 p.m. Rentals are located at the concessions window just below the Christine Hensley Terrace. 10:00 a.m. – Plant.Grow.Fly. (Butterfly Garden Planting) Des Moines Parks and Recreation is helping Monarch butterflies and pollinators in our city parks and you can help too. From 10:00 a.m. - 12:00 p.m. will be a Plant.Grow.Fly. event at the Christine Hensley Terrace. Sign up to be part of the program and not only will you help create the a new Butterfly Garden with native Iowa species, but you will make a butterfly friendly planter to take home with you on the same day. Be prepared to get your hands dirty and do a little work to help out Monarchs and pollinators. Registration for the event is limit to 25 participants and there is a fee of $10 per take home planter created. Everyone is welcome, anyone under 16 years of age must be accompanied by an adult. 8:30 p.m. – Free Flicks Movie Series – This will serve as the kickoff event to the 2019 Free Flicks Movie Series. The movie will start at approximately 8:30 p.m. on the southeast lawn. Families are encouraged to bring chairs or blankets to sit out under the stars to enjoy this unique opportunity at Gray’s Lake Park. 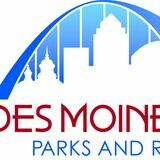 This July, Des Moines Parks and Recreation is once again celebrating National Parks and Recreation Month by inviting residents to get out and take a tour of our parks, trails and facilities with “Tour DM Parks.” From July 1 - 31 participants can visit 31 designated spots in the park system and share a photo on Facebook, Twitter or Instagram with the hashtag #tourdmparks2019. Those who visit all 31 locations are eligible to compete to win the grand prize of $1,000 CASH courtesy of the Friends of Des Moines Parks. For the full tour itinerary, contest information and mobile friendly map, visit dmparks.org/tourdmparks. Give back, clean-up and find the “cached” prizes. Join us Easter weekend to go on a fun family eco-hunt. City of Des Moines Parks and Recreation, Iowa Geocacher’s Association, Westwood Neighborhood Association, Walnut Creek Watershed Coalition, and other concerned citizens invite you on our unique hunt for trash. Help improve our creeks and Central Iowa’s water quality! Our open registration period begins April 1 and any remaining available plots will be open to fill. Please check availability online at dmparks.org. Wednesdays, 6:00 p.m. 8:00 p.m.
9/10 4:15 p.m. - 7:30 p.m. 9/11 4:15 p.m. - 7:30 p.m. 9/14 11:15 a.m. - 2:30 p.m.
Glendale Cemetery, 4909 University Ave. Laurel Hill Cemetery, 3601 East Court Ave.
Decoration Day began after the Civil War. After World War I, it became a way to honor those that died serving in any war or military action. Today we know this holiday as Memorial Day. Many people observe the holiday by visiting graves of loved ones, leaving decorations in their memory. By July, the weather and elements have taken a toll on the decorations and they are ready to be removed. Volunteers will assist in removing decorations and properly disposing of them. Training will be provided on the day of the cleanup. Volunteers will be working outside, and should be able to bend, lift and walk. 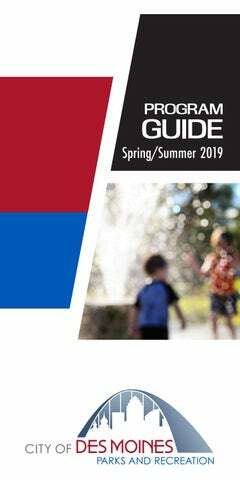 https://cityofdesmoinesparksandrecreationdepartment.volunteerlocal. com/volunteer/?id=35465 Shifts: 9:00 a.m. - 12:00 p.m., 12:30 p.m. - 3:30 p.m. Monday, July 1st Glendale Cemetery, 4909 University Ave.
Join local historian and educator Archie Cook on a tour through the grassy knolls and stately trees of one of our cityâ&#x20AC;&#x2122;s oldest treasures. Tours (rain or shine) are recommended for those ages 10 and up, last approximately 2.5 hours and are free. A donation is suggested and will go towards the Woodland Monument Restoration Project. Children and strollers are permitted but some sections of the tour will not be easily accessible for strollers due to rough terrain. Registration is limited to 50. Visit facebook.com/desmoinesparks to select your date and sign up. Tuesday, July 2nd Glendale Cemetery, 4909 University Ave. Wednesday, July 3rd Glendale Cemetery, 4909 University Ave. Friday, July 5th Laurel Hill Cemetery, 3601 East Court Ave.
Glendale Cemetery, 4909 University Ave.
1:00 p.m. - 3:30 p.m. 1:00 p.m. - 3:30 p.m. 9:00 a.m. - 11:30 a.m. 9:00 a.m. - 11:30 a.m. 9:00 a.m. - 11:30 a.m. 1:00 p.m. - 3:30 p.m. 1:00 p.m. - 3:30 p.m.